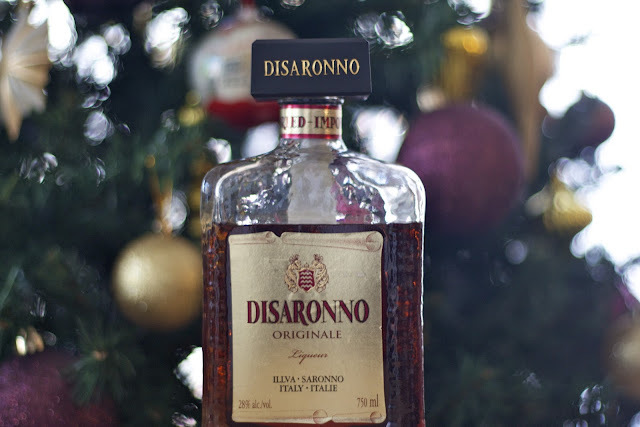 Sweet-D Cakes: Nothing says the holidays like liquor-infused baked goods! Nothing says the holidays like liquor-infused baked goods! So much for a baking break. 'Tis the season of potlucks. I always struggle with whether to bring something cooked and savoury rather than a sweet treat, but the struggle is always short lived and out comes the butter, milk, eggs, sugar and flour. This week: 2 potlucks in 3 days. With all of the business of the season and planning desserts and cakes for family Christmas dinners and an upcoming birthday, there isn't a lot of time for making anything elaborately decorated. I decided to compensate with alcohol. For my first potluck, I decided to make the Chocolate Amaretto Bundt Cake from the Magnolia Bakery cookbook. I haven't done a lot of baking of desserts that don't end up being covered in icing or fondant. 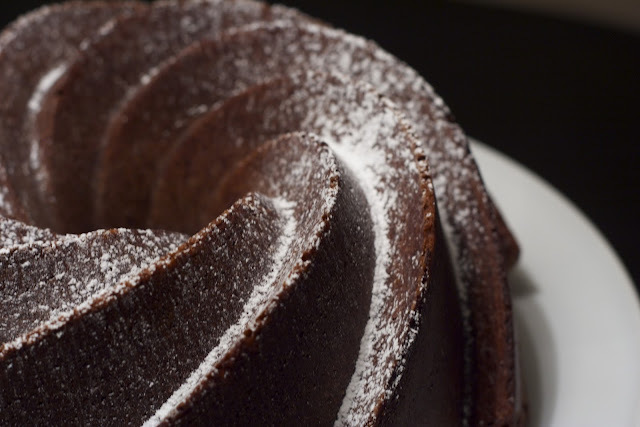 How you make a bundt cake pretty? I used the Heritage Bundt Cake pan from Williams Sonoma. The pan creates a beautiful swirl design. 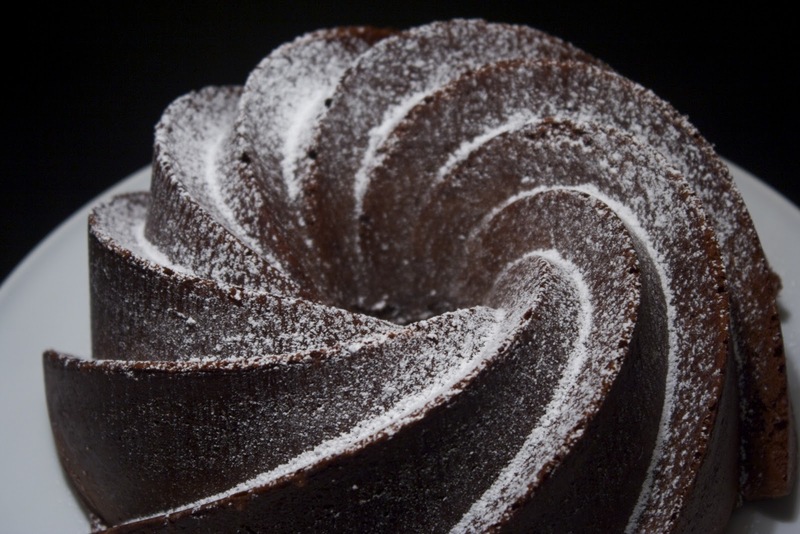 I've made one bundt cake before - it was the recipe that came with the pan. I found it on the dry side and it needed to be a la mode to improve the moistness and palatability. This chocolate amaretto cake promised to be delightfully moist. I've read about dusting a lightly greased pan for a chocolate cake with cocoa powder rather than flour in order to avoid remnants of white flour on a dark cake. I attempted this with little success - the cocoa powder stuck in clumps to the greased pan and it dissolved slightly. I brushed the excess cocoa powder out with a pastry brush and dusted the pan (easily) with flour. I had no issues with white residue on the cake, despite using flour. I (not so) lightly dusted the cake with icing sugar - just like a light dusting of snow. The cake was, as promised, quite moist with a nice, strong amaretto flavour which comes from using good amounts of both almond extract and amaretto liqueur. I still think the cake might be improved with some sort of chocolate glaze although I would use a different pan in that case because I feel that a glaze would detract from the simple beauty of the swirl design.